The Chevalier Rene D’Herblay, known for some time now as the musketeer Aramis, was sure that no one could have murdered his mistress. A tall, slim man whose long blond hair and normally elaborate attire made people underestimate his strength, Aramis stood naked in the inner doorway of her room. His numb hands gripped the wooden frame for support, because his knees had gone unaccountably lax. He looked out, unbelieving, at the huge bed that took up a quarter of the bedroom. The bed was high and heavy and massive—a solid construction of Spanish oak that had probably come in Violette’s dowry when she’d married a French duke. Upon the oak, soft draperies had been heaped, to make the bed suitable for someone of Violette’s soft skin and softer habits— there was lace and velvet and a profusion of pillows of all shapes and sizes. Aramis knew that bed better than he knew his own. He had been Violette’s lover for two years and he’d spent considerably more time awake in her bed than his. He grasped the doorway hard, for support, and blinked dumbly at the bed. Because on the bed, Violette lay — dead. Violette who, only minutes ago had been lively, full of fire, eager for his embraces and inventive with her own. Now she lay . . . He felt sweat start at his hairline, a cold sweat of fear and disbelief. And blinking didn’t seem to change the scene his eyes showed him. Violette could not be dead. And yet she lay on the bed, motionless, her normally pink body gone the color of cheap candle tallow, her mouth open and her eyes staring fixedly at the canopy of pink satin over her. Between her perfect, rounded breasts that his hands and lips knew as well as his eyes did, an intrusion—an ivory handle—protruded. And around her breasts, there was blood, dripping into the lace and pillows, soaking into the satin and frills. Aramis swallowed hard, fighting back nausea and a primal scream of grief that wanted to tear through his lips. His mind, still in control, feverishly went over and over the reasons why this was impossible. First, he’d left her alive when he’d gone into the small room next to her room where—out of modesty or high breeding—she kept the chaise percée used for calls of nature. Second, he’d taken no more than a moment there. He was sure of it. And he’d heard no doors close or open anywhere. Third, the door to the room was locked— as it had been locked when they first lay down together. He’d turned the large key himself, heard it click home. Fourth, they were three floors up in the royal palace, with sentinels and guards all around and thick walls encircling the whole structure. And there was only one small window in the room—too small to admit anyone—and a door to a narrow balcony well away from other walls and trees. The balcony was large enough, only, for two people to stand close together. The structure of the bed was built too low to the floor to conceal anyone beneath it. No one could have come into the room. And Violette was not the sort to commit suicide. Or to commit it with a knife to the heart. No woman was. This Aramis—who knew many women—knew. They were more inclined to the poison that would pluck them from life while they slept. Not that he’d ever had any of his mistresses die this way. But he’d heard about it. He’d . . . read. He struggled to stand on his own, pulling his hands away from the doorway. Violette couldn’t be dead, ergo, she must be alive. And if she was alive this must all be a tasteless joke. Trying to stand steadily, he took a deep breath and inhaled the sharp, metallic smell of blood. But Violette would be thorough in her jokes as she was in everything else. It would be real blood. Animal blood. Yes, that must be it. He charged forward, to the bed, and put out a hand to shake her hand resting, half-closed, on the frilly coverlet near a pool of blood that seemed more abundant and darker than he’d have imagined possible. It was soaking into the fabric and probably into the mattress beneath. His hand touched her arm. Before he could control himself, he jumped back, his hands covering his mouth, but not in time to hold back his shocked scream. She felt . . . not exactly cold, but not as warm as living flesh should feel. Blindly, he reached forward, grasped the handle of the knife, pulled it. It came away in his hand, stained red and dripping. It had truly been buried in her flesh. And her skin felt dead. Aramis knew dead. He’d killed men enough in duel and in combat ever since that day, when he—still known as Chevalier D’Herblay—was barely more than nineteen and a young man had caught him reading the lives of saints to the young man’s sister. Well, at least that was what Aramis still told everyone he had been doing. The truth was somewhere closer to his having demonstrated to the young lady the biblical intricacies of the word know. The young woman’s brother had objected and challenged D’Herblay for a duel. And D’Herblay, knowing instinctively that his fashionable looks, his command of Latin grammar or even his wielding of sharp rhetoric would not get him out of this situation, had looked for the best fencing master in Paris, Monsieur Pierre Du Vallon. So good had Du Vallon’s lessons proved that D’Herblay had killed the prudish young man. Which, since dueling was forbidden by royal edict and punishable at the end of the executioner’s blade, had led to D’Herblay’s and Du Vallon’s going into hiding under the assumed names of Aramis and Porthos in the uniform of his majesty’s musketeers. Since then Aramis had fought more duels than he cared to think about. His and Porthos’s acquaintance with a disgraced nobleman who called himself Athos and with a young Gascon hothead called D’Artagnan had done nothing to make his life more peaceful. Among the four of them, one or the other was forever challenging someone to a duel and calling on all his friends to serve as seconds. 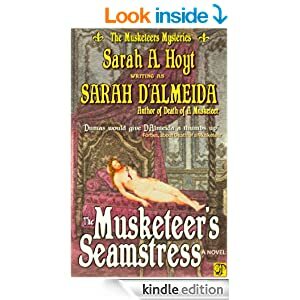 He’d killed men, he’d seen corpses—Aramis heard his lips, loudly, mutter a string of Ave Marias over his past sins—but he`d never been near anyone murdered like this, in the safety of her room, in the privacy of her boudoir. And not while only Aramis was present. Not while only Aramis could have done it. His hand over his mouth, the other hand gripping the bloody knife, he’d backed up until his behind fetched up against one of Violette’s innumerable, amusing little tables, covered in more lace, velvet, satin, and stacked high with books she never read, her command of written French being shaky and her interest in the written word being far secondary to her interest in other pastimes. Through the roaring in his ears, he was dimly aware that people were knocking at the door and at least one, female voice, was shouting a string of Spanish names, followed by other, equally Spanish words. The names were Violette’s. Her real name was a string of proper names—starting with Ysabella—followed by a string of surnames, all connected by y and de which Aramis could not hope to understand or remember. Ever since—on a cold night, when he stood guard at the royal palace—she’d approached him and told him her name was Violette, he’d called her that and nothing else. But the knocking on the door seemed like a distant worry. Closer at hand, Aramis was grappling with his soul. Ever since his father had died, when Aramis was no more than two, Aramis’s pious and noble mother had decided her young son was bound for the church. So, wherever his path took him, he dragged with him the excellent, thorough and insistent religious education his mother had given him. Even now, in uniform for many years, Aramis considered himself a priest in training. As soon as he cleared his name enough for some monastery to take him, he would take orders. He was aware of the serious and grave sins he committed with Violette who was, after all, married to some French nobleman living in the far provinces. True, her marriage had been one arranged to match the marriage of the Queen, Anne of Austria, her childhood companion and friend. Violette, to hear her talk, barely knew her husband, with whom she had not spent more than the two weeks of the wedding festivities. He enjoyed rural pleasures, and she’d lingered at court with her friend the Queen. And she’d found Aramis. And there, Aramis thought, lay the crux of the sin, for they’d sinned often and in very imaginative ways. And had not, perhaps, some angel reached from heaven to smite with ivory dagger the cleft between Violette’s perfect breasts? But the banging on the door grew more insistent and Aramis’s knowledge of Latin allowed him to guess that the Spanish-speaking woman wished to know who had screamed and why. She would not be appeased by anything but Violette’s voice. A voice that would not be heard, again, till the angel of the apocalypse sounded the final trumpet. Naked, scared, shocked, Aramis stood and stared at the door which shook under the impact of many hands, many fists. Cold sweat ran down his face. He felt his hand tremble. He’d never trembled in battlefield or field of honor, but this . . . This supernatural retribution, he could not endure. And yet, if an angel had struck, would he not have killed both of them while they were abandoned to their pleasure? And why would an angel wait until Aramis went to the little room to attend a call of nature? Despite his education—or perhaps because of it, for, after all, it had included logic—Aramis had an analytical mind which shouted over the vapors of his fear and the madness of his religious guilt to tell him that a human hand had killed Violette. A human hand not Aramis’s. Perhaps, he thought, there was a tunnel into this room? After all, any palace of any age at all had more tunnels, secret passages and hidden rooms than a rabbit warren had exits. But, looking around the room, he could not imagine where the tunnel would open. Every available palm length of wall had one of Violette’s cabinets, tables, chaises leaning against it. And all of it was solid, heavy Spanish furniture which would not be moved by a simple door springing open behind it. Aramis, well versed in the art of ordering palace staff knew that it would only be a matter of minutes before some sturdy lads were brought forth and their shoulders applied to the door. The lock was solid, but not that solid. It would open. And they would catch him here. Alone. With Violette’s corpse. How long before the gibbet was built and he was hanged? Or would he be lucky enough to be beheaded? One of his long, pale hands went, unmeant, to his long, elegant neck. It would kill his mother. He edged towards the balcony door. It was the only way out. But it was not a true way out. All he could hope for was to fall to the hard ground and die. But at least he wouldn’t die on the gallows or the block. He would not bring that shame onto his mother. Filled with a decision he could only half muster, his hands tore at the door, forcing it open. The warm air of spring rushed in on him, a scent of trees and grass and, beyond that, the scent of manure and cooking fires that was the essence of the great, bustling city of Paris. His ears unnaturally sharpened by his fear, he could hear somewhere on the grounds of the palace the rough laughter of musketeers on guard and the sound of dice being tumbled. Was Athos or Porthos on guard tonight? He could not remember. Truth was he could not remember what day it was anymore and his normally perfect knowledge of his friends’ guard schedules had slipped wholly from his mind. It was a punishment that in the end, his wit, which had always been his defense, would desert him. The sound of the knocks on the door changed. Ah. Sturdy shoulders applied with a will. Aramis stepped out onto the balcony, which was semicircular, built of stone and surrounded with little cylindrical columns of stone topped by a carved parapet. The polished stone felt rough against his nakedness, as he leaned over to look three stories below, to the paving of an ornamental patio surrounded by flowerbeds. On one of the flowerbeds, in front of the balcony, a lone tree stood, filled with the kind of tender green leaves that spring fostered, leaves still small enough that one could see the tree branches thrust skyward like the hands of beseeching sinners beneath their sparkling green livery. If Aramis flung himself out . . . If he threw himself out towards it . . . He narrowed his eyes, calculating the distance, which was more than that of his outstretched body were he laid in the air between it and the balcony. And worse, the thickest part of the tree was a good story below. His body had been honed through years of duels and sword practice. He knew his muscles could perform amazing leaps in the heat of combat. But here, in midair, with nothing to push against, how was he to reach for the saving branch of the distant tree? And even if he managed to get down there, how could he save himself, naked and—he looked down—somehow smeared with Violette’s blood? How could he escape the palace and its well-guarded entrances? Everyone knew he was in here with Violette. Or, if not, everyone would guess when they found his uniform tossed casually over one of her chaises. He took a step in the room, not so much intending to retrieve the uniform, but thinking of the uniform, the image of his blue tunic in his mind and a vague idea that he should collect it. And he heard the crack of the door, as it gave under the assault of young men’s shoulders. If he jumped, it would be suicide. But if he stayed here, they would kill him. Suicide was a sin. Without thinking, with no time to plan, he scrambled up onto the little stone parapet. He put the handle of the knife between his teeth. He could always use it on himself if it looked like he’d be captured alive. He would shame neither his mother nor his friends. He crossed himself. And then he jumped, somersaulting, his body twisting midair, his arms reaching hopelessly towards the impossible hold of the distant tree branches.